I know it sounds unthinkable, but the National Institute of Child Health and Development (NICHD) is funding experiments that have deliberately starved pregnant baboons to see what effect it will have on their offspring. One study looked at heart development of young baboons born to malnourished mothers. Not surprisingly, these young baboons had cardiac abnormalities that resulted in premature aging of the heart. Click here to send your comment to the Director of the NICHD objecting to the use of federal funds to carry out these cruel and medically pointless experiments which cost tax-payers $1.78 million in 2017 alone. The study, conducted on baboons housed at the Southwest National Primate Research Center, was carried out by the Department of Animal Sciences at the University of Wyoming. 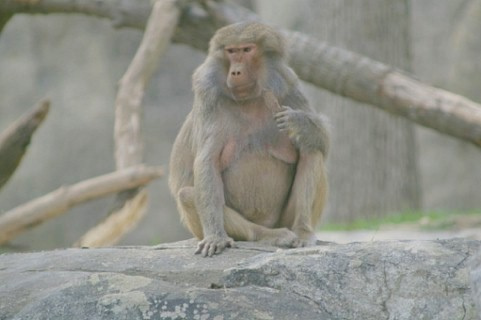 Pregnant baboons were starved on a diet lacking one-third of the calories in a normal diet so that they were chronically malnourished during pregnancy and nursing. This is a huge deficit for pregnant animals whose bodies must cope with the metabolic burden of the developing infant. The young baboons weigh 10% less than normal baboons of the same age and are now being used in studies to determine what effects this has on their developing bodies. After the heart study is over, they will be used in further research. Tragically, these unfortunate animals will be subjected to a lifetime of experiments. The baboons are housed in a colony and must be captured, isolated and sedated to get regular blood pressure measurements. They also undergo cardiac MRIs, which is normally a non-invasive procedure in people. But because animals cannot voluntarily cooperate, they are given general anesthesia and intubated on a respiratory ventilator. The stress that these invasive procedures place on the baboons undoubtedly has a profound impact on their entire cardiovascular system, negating the validity of the research. Worldwide, there have been many studies on the effects of low-birth-weight on children, including cardiac defects. Cardiac MRI is a painless and non-invasive way to study the physiology of the heart in human patients, including children. The baboon studies are nothing but cruel and unjustifiable.